Americans inherently cherish their independence and freedom, so when the time comes to address the issue of older adult loved ones giving up their driving privileges for their safety and the safety of others, the conversation can be quite difficult. But the discussion about seniors and safe driving is important to have as soon as you see a change. Maybe you’ve noticed a few new dings and dents in Dad’s car. Perhaps you’ve heard from their neighbors or friends that they have had “close calls” on the road. Sometimes seniors begin taking medication that affects their driving. Perhaps Mom is having problems with her decision making and her memory. When seniors are asked to stop driving, these are the top five objections caregivers are likely to hear. If it’s time to ask Mom or Dad to put their car permanently in park, you will need to be prepared to answer any arguments. Sometimes seniors are better historians than visionaries, according to Vicki. However, just because they’ve had a safe driving record in the past doesn’t mean they’ll drive safely in the future, just due to the natural aging process. Older adults have slower reaction times, which automatically impairs their driving. According to statistics, people over the age of 70, where a two-car collision is involved older drivers are 3.5 times more likely to die in an accident, even if they are not at-fault. According to the National Highway Traffic Safety Administration, the average senior out-lives their safe driving period by 7-10 years. When it comes to motorists with dementia, there is a five-fold increase risk of accidents, with 50 percent being involved in some sort of motor vehicle accident within five years from diagnosis. Safe driving is the culmination of split-second decisions. Just because an older adult isn’t speeding or breaking the rules of the road, that doesn’t mean they aren’t creating dangerous situations for themselves and others. Senior drivers recognize that their reactions slow down, and therefore cause hazards while they are trying to drive extra cautiously. Examples include stomping on the gas pedal when they mean to hit the brakes, or activating the turn signal prematurely when changing lanes (or forgetting to activate it at all). This is one you may hear if your senior loved one has dementia, which can lead to paranoia and agitation. Vicki recommends bringing in reinforcements to deal with this issue, including other family members and maybe even Mom or Dad’s minister or doctor. Having multiple voices involved that they trust will help to prove that a discussion of your loved one’s driving is a serious issue and not just an excuse to have an argument. Vicki says a drive around the block may be well worth it to convince a senior to give up their license. You need to be able to give specific answers to make a convincing argument. “Mom, do you know you’re crossing the centerline?” She can’t argue with you if you witness them doing it. You must have this conversation based on skills and facts, not emotions and opinions. It’s uncomfortable for most of us to have to have a confrontation with our parents, including those that result in taking away driving privileges from Mom and Dad. After all, your parents are the ones who taught you how to drive! 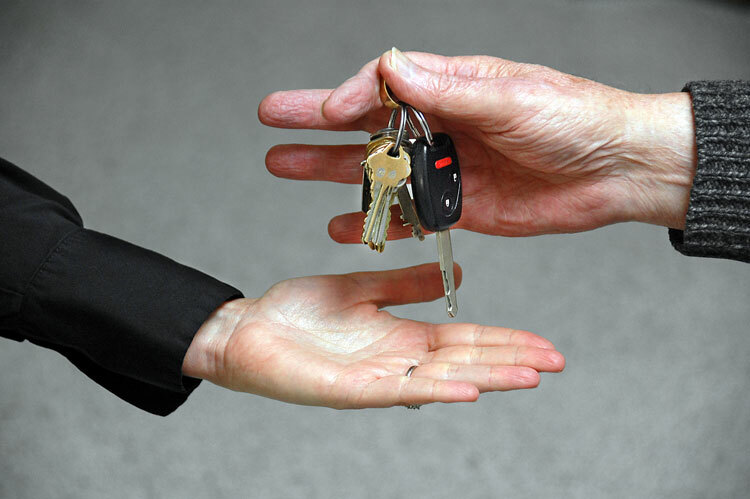 Taking their keys could seem like a personal betrayal. But consider that this is not just for their safety. It’s also for the safety of the children who play in their neighborhood, the families that drive the same city streets, and the family and friends our seniors love. It’s important to “stick to your guns” if it’s time for your aging parent to stop driving. Vicki suggests that it will help if you offer an alternate form of transportation. If Mom or Dad see that they can go about their daily routines without their car, they’re less likely to miss it. If you arrange to take them to their doctor appointments or to the grocery store, it’s a great way to spend more time with them and to keep tabs on what they’re eating, how they’re feeling and if they’re taking proper care of themselves. If it’s time to have the conversation with your Mom or Dad, Bethesda is here to help. Join us for our Seniors and Safe Driving presentations with Gray Matters Alliance, where we will discuss Aging Parents and Driving and Driving Under the Influence of Dementia. Reserve your spot today by calling 314-800-1938!